WordPress popularity, and Big Name Brands that use it. WordPress is known to power 26% of the world’s websites. WordPress popularity as Open Source solution is expected to grow by more than 30% in coming years. WordPress has a CMS market share of ~59%. Blogvault.net suggests some great reasons on why WordPress is so popular. While the WordPress community across the world was growing, and more and more people were building WordPress sites for varied purposes, only the recent release of statistics has managed to shine a light on how big the CMS has actually become. About 26% of websites in the world are said to be powered by WordPress. Unsure about using WordPress for your website? 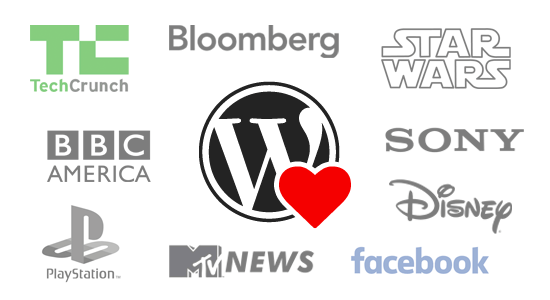 WPbeginner explains about some of these notable companies that use WordPress open source as the platform of choice for their site. It’s a great list of some big names. If one is considering a new or redesigned site consider WordPress. Learn it’s many advantages as a platform. It may not be suited for all businesses, but could prove to be a great fit. Will these SEO techniques bring website traffic?